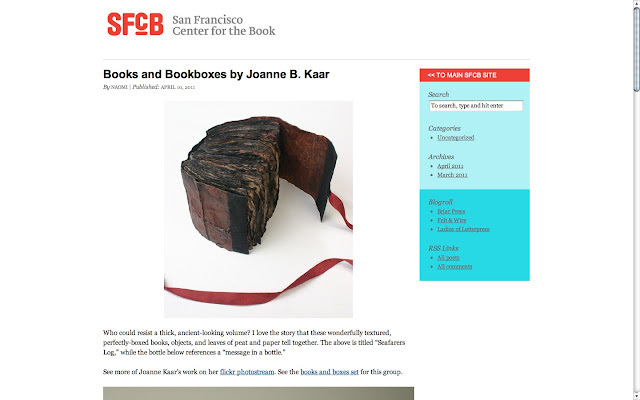 For the last few months I've been volunteering at the wonderful San Francisco Center for the Book. And recently, I've started contributing to their new blog! So far I've been posting about my favorite book art and artists. Many of my planned and past posts touch on work that explores the relationship between analog books and digital media or e-books. Other posts are simply appreciating and ruminating on some of the beautiful work that book artists have created. Other posts so far have been about events, workshops, and classes held by or connected to the Center. Definitely check out the blog! You can also see all the posts I've made so far.